Today’s work was non-clinical but quite fulfilling all the same. 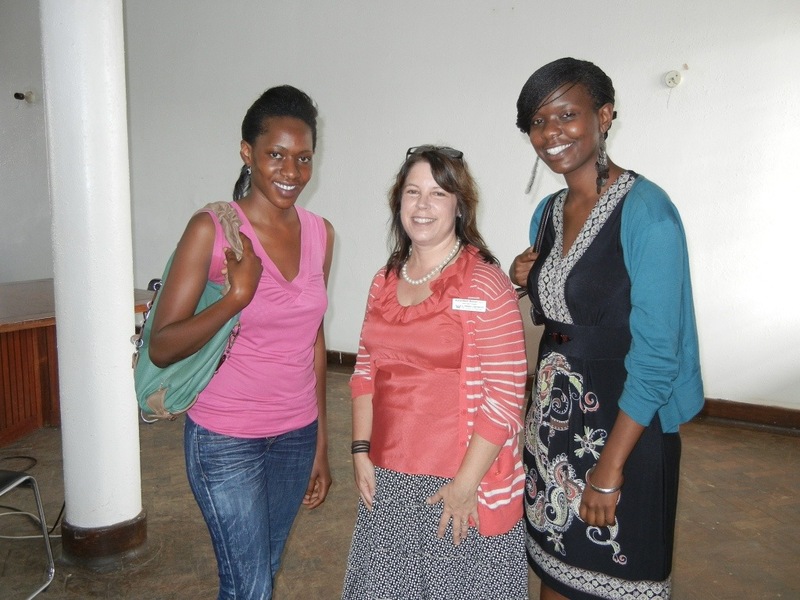 We got a really early start (7am) and attended the annual meeting of the Pharmaceutical Society of Uganda (PSU) for the purpose of administering the Pharmaceutical Care Needs Assessment questionnaire that a Wilkes student and I designed in collaboration with a faulty member at Makerere University School of Pharmacy and the Secretary of the PSU. There are somewhere between 400-600 practicing pharmacists in Uganda and there must have been at least 200 at today’s meeting. 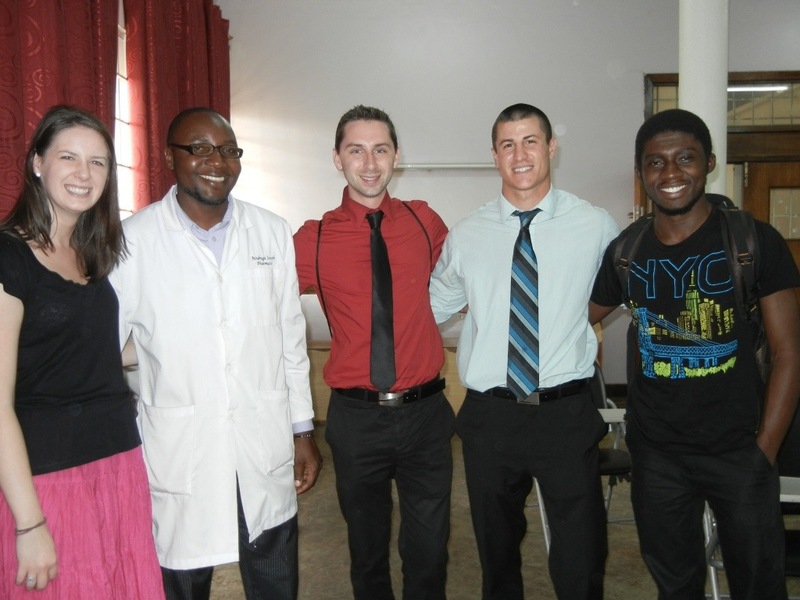 The survey results will provide a baseline record of the types of pharmaceutical care activities that are being provided by Ugandan pharmacists today so that we can watch this grow as the collaboration of Wilkes University and D’Youville College with Makerere University and PSU gets off the ground. In addition, we are collecting info about the types of programs pharmacists want to participate in along with the resources they are willing to commit to advanced training. 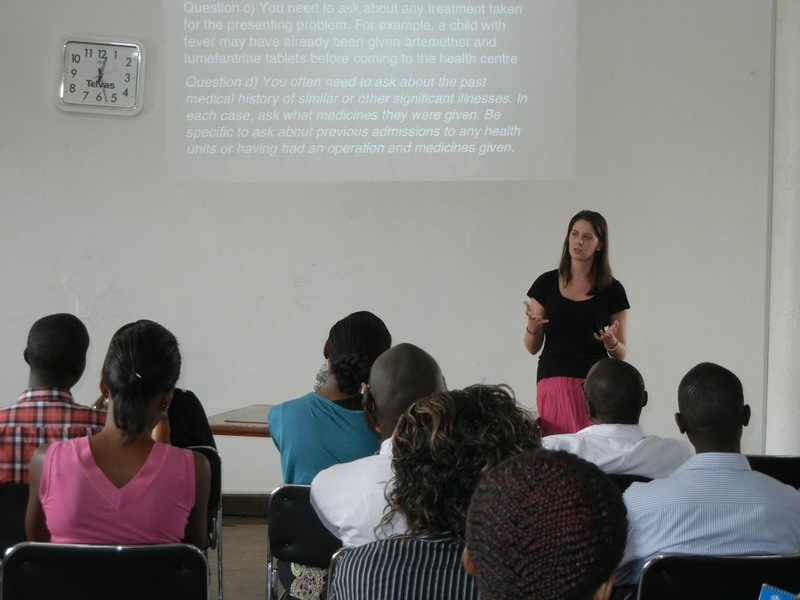 This afternoon the students and I went back to Mulago Hospital to give a presentation for about 40 of the Pharmacy Interns. This is something I have them prepare prior to our trip as an educational session for the interns. 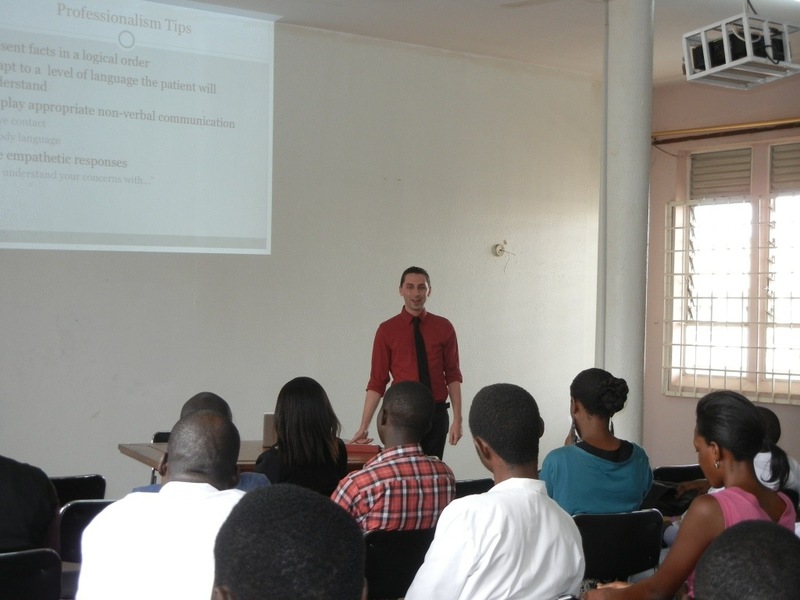 Jeff discussed the basics of Patient Counseling Skills. 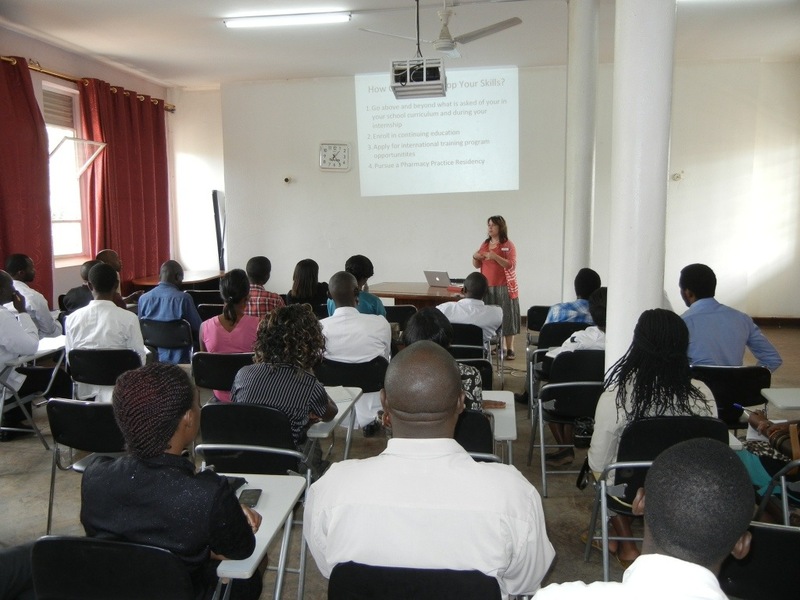 Although this a primary focus in US pharmacy schools, at Makerere University, students are exposed to only a few direct interactions with patients. Stacy spoke about an advanced form of counseling called Motivational Interviewing. Instead of the pharmacist just giving information to the patient and expecting them to remember it and utilize it, the pharmacist engages the patient in a conversation about their medications and diseases and learns what will motivate the patient so that they can share in the decision-making process. Finally, Nikko concluded the first half of the presentation by changing topics and discussing how to utilize free smart phone applications to help the pharmacists improve patient care by providing drug information at the time of service during rounds. 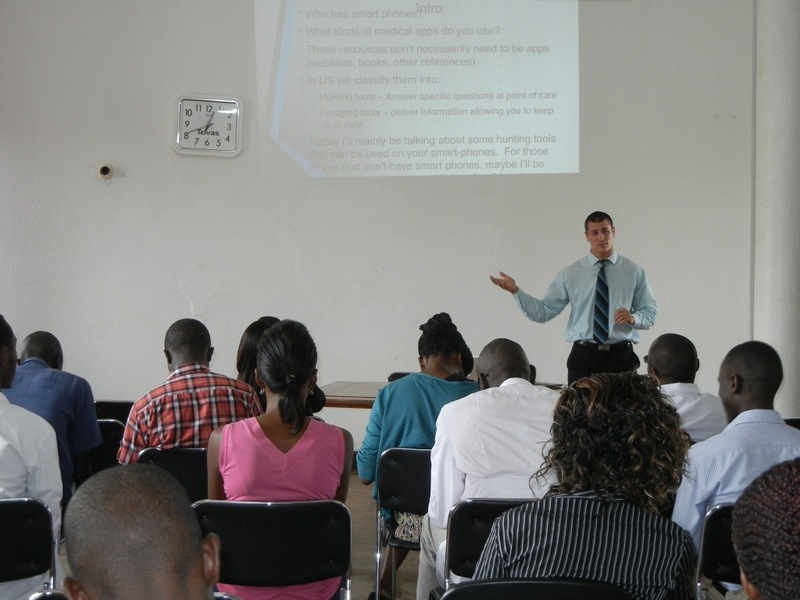 Internet enabled phones are becoming as popular and common in Uganda among students and young professionals as they are in the U.S.
During the 2nd part of the presentation, the students gave examples of the types of Pharmaceutical Care activities that they have participated in while on their clinical rotations this year. I ended the talk by providing information about how the Ugandan pharmacists can advance their own training, from being self-motivated to learn on their own to specifically outlining the requirements for their participation in pharmacy residencies or other training in the USA. Throughout the entire talk, the interns were actively engaged in our presentation. I was really thrilled to see how many were interested in gaining advanced skills and becoming a more integral part of patient care by directly interacting with patients as well as work on a team with other healthcare providers. This entry was posted in Diseases/Health, My Safari (My Journey/Adventure) and tagged D'Youville College, Mulago National Hospital, pharmaceutical care, pharmacy practice, Pharmacy Students, Uganda, Wilkes University. Bookmark the permalink.